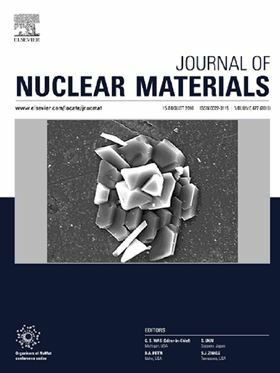 We’re delighted to announce the Journal of Nuclear Materials best paper award. The award is given biennially to the paper judged as the most deserving in the last two years. In this case publications in the Journal in 2013 and 2014 were considered. The selection was made by vote of all the Editors of the Journal. A. Certain, S. Kuchibhatla, V. Shutthanandan, D.T. Hoelzer, T.R. Allen, Radiation stability of nanoclusters in nano-structured oxide dispersion strengthened (ODS) steels, Journal of Nuclear Materials, Volume 434, Issues 1–3, 2013, pages 311-321. B. A. Pint, K. A. Terrani M. P. Brady, T. Cheng and J. R. Keiser, "High Temperature Oxidation of Fuel Cladding Candidate Materials in Steam-Hydrogen Environments," Journal of Nuclear Materials, 440, 2013, pages 420-427. Dr Bruce Pint will present an overview of his award winning paper at NUMAT 2016. In addition to the best paper prizes, Professor Srikumar Banerjee will be awarded the Robert Cahn award at the conference. For more details on the award, and to see a selection of Professor Banerjee’s work, please visit this link: http://www.journals.elsevier.com/journal-of-nuclear-materials/news/robert-cahn-award-announcement.